Cool weather. Time for soup. This one is a variation on a recipe from the Gardner Museum Café Cookbook. Groton’s own Blood Farm ham is a salty and smoky variety – you can substitute Virginia Ham. The Blood Farm ham can be leftover baked ham (I bake it with bourbon, cloves and brown sugar) or grilled ham steak – each version imparts a slightly different flavor to the soup. If you are using grilled ham you might want to add a little extra sherry. There is room to play with the amounts of some things (I often skip the cream) but the fresh basil, parsley, peppers and mushrooms are key to the flavor of this soup. In a large sauté pan over medium heat, melt half of the butter, and add the garlic and onion. Sauté until the onion is translucent, then add the parsley, basil, bay leaf and ham, then sauté another 3 minutes. Transfer to a large sauced pan or soup pot. Add the chicken stock and let it simmer while you do the next step. Reduce the heat to medium low and add the beans, corn and cream (if using). Simmer for 10 minutes, then add the pepper and sea salt to taste. Reheats nicely. This post first appeared in October of 2012. 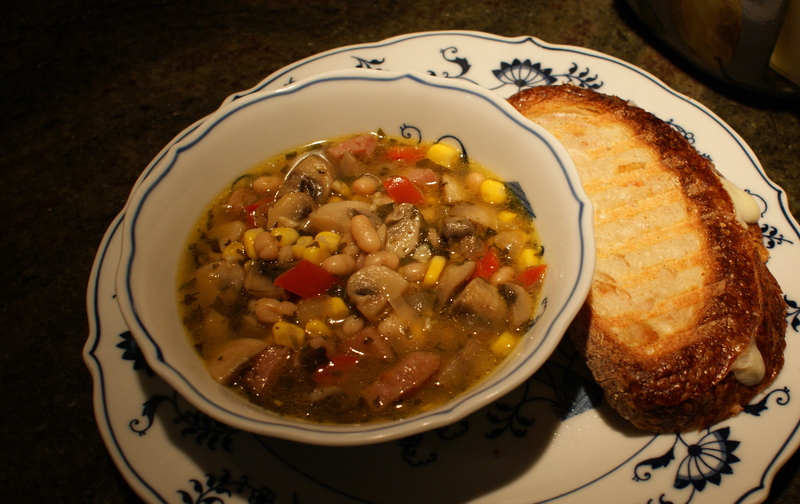 This entry was posted in Blood Farm, Cookbook, Corn, Dinner, Gardner Museum Cafe Cookbook, Gluten free, Ham, Soup, Sweet Red Peppers, Vegetable and White Bean with Ham, Vegetables, Winter Food and tagged Blood Farm Ham, Dinner, food, Gardner Museum Cafe Cookbook, Gluten free, gluten free soup, gluten free vegetable soup recipe, ham soup, mushroom and red pepper soup, red peppers, sherry in soup, soup, soup recipe, vegetable and white bean soup, vegetable soup, white beans. Bookmark the permalink. All content, including photographs unless otherwise credited, ©LettersHead 2019. Unauthorized use and/or duplication of this material without express and written permission from this blog’s author and/or owner is strictly prohibited. Excerpts and links may be used, provided that full and clear credit is given to LettersHead with appropriate and specific direction to the original content.